How was your day? Mine was fantastic. Spending time with my nephews always is fantastic. They stayed up late, and after they left and I started writing this post, my Internet stopped working. So sorry for late post. 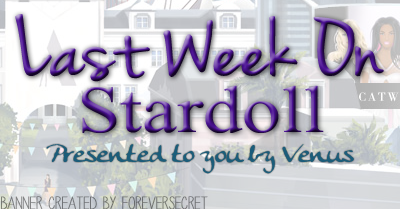 Anyway, this week on Stardoll seemed kinda slow. Maybe Stardoll staff are working hard on designing a newest collection of Limited Edition, and choosing a Face of LE, looking through thousands pf photos, graphics, etc, in order to give us a real, well deserving winner. Excited? Me too, even though I didn't enter the contest and don't have much stardollars to spend on a new LE collection. I'm saving up, and trying to sell some stuff, like many others do. But let's see what were the highlights of a this week on Stardoll. The first release was on Tuesday, a new Tress-Up wig collection, which included some Doree hair colors as well. The collection is named "an Ombré", inspired by popular trend in dying hair. There are some really great hairstyles, but prices are higher than usual, and there are few items available for Superstar/Royalty members only. Also, some may seem to be inspired by celebrities, and some others by wing designs from some talented wig stardesigners on Stardoll. Despite all that, Tress Up seems like a better choice than stardesigned wigs, as they are cheaper, we can try on wigs and recolor them. A big like from me for this collection, though I bought only 2 wigs, but I do plan on buying more. On Wednesday, as expected, we got another Callie's Picks collection - "Bikinimania"
The collection consist of mostly swimsuits, with a few other items, some accessories, shoes, etc. There are some really nice bikinis out there, and with new Underneath Stardoll covers you don't have to worry about white parts sticking out. There is a nice amount of previously released HotBuys, whihc makes me wonder - are there any people who still collect hotbuys? Because Callie always includes some of them in her picks. Also, I am pleasantly surprised by the way outfits look on mannequins, as they usually seem like randomly thrown. My highlight of a week was definitely new Ink'd collection, which arrived on Friday. The tattoos and piercings are really beautiful. Many of them, if not all, are inspired by celebrity tattoos. There are some Superstar only items too. (Seems like a new trend on Stardoll- releasing few superstar only items in each collection. I don't like it.) I do plan on buying all of them after the LE craze is over. Ugh.. I am just not used to writing this recap on Monday. Seems like my brain is programmed to write those recaps on Sunday evening. So sorry for short post. (There wasn't much to write though.) Anyway, that's it for a previous week, vote on the poll, share your opinion, and see you soon.